At the American-Scottish Foundation, we take great pride in being a founding member of the National Tartan Day New York Committee, together with the St Andrews Society of the State of New York, the New York Caledonian Club, and more recent member Clan Campbell. 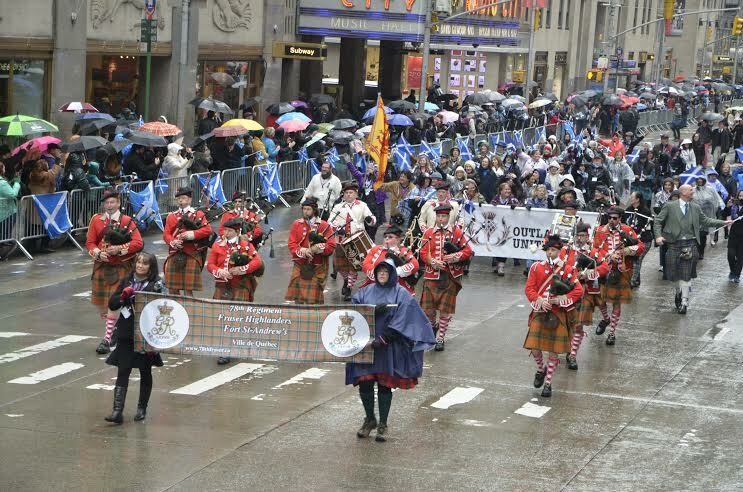 We work together to coordinate joint and separate events and festivities during the annual New York City Tartan Week, including the annual Tartan Day Parade, which is now the biggest event of its kind in the United States. 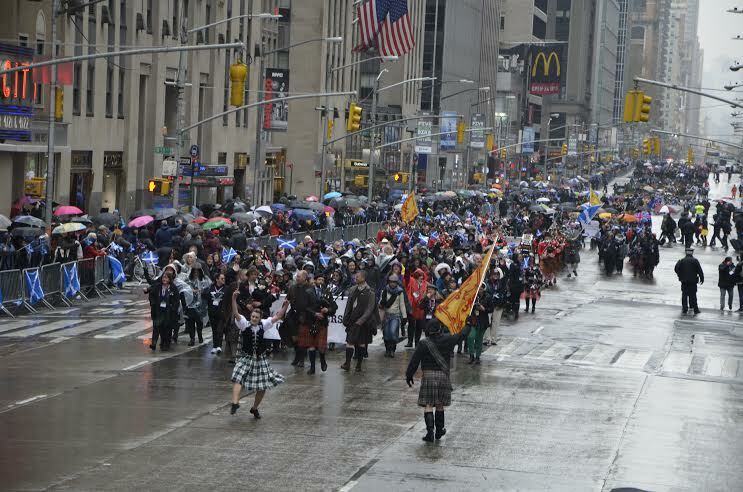 We love hearing from fans of the Tartan Week festivities, so it was great to see the enthusiastic response of Outlander fans at the 18th annual New York Tartan Day parade. Outlander is a time-travel television series based on the novels by Diana Gabaldon. It stars Caitriona Balfe as Claire Randall, a married World War II nurse in 1945 who is mysteriously transported back to Scotland in 1743, where she meets the handsome Highland warrior Jamie Fraser, played by Sam Heughan. 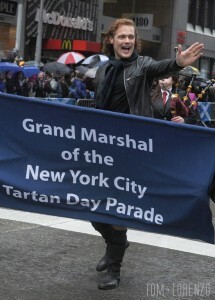 Heughan was the Grand Marshal of this year’s parade. With Sam Heughan leading this year’s Tartan Day Parade, Outlander fans flocked to New York this year in even greater numbers than were with us last year when Graham McTavish, another great actor from the series, was Grand Marshal. It was no surprise that many Outlander fans came and participated in the parade from all over the Unites States Britain and Europe. Over 450 members of the fan group Outlander United marched in the parade, while thousands lined the streets just hoping to catch a glimpse of Heughan. Scotland Now calls the Outlander effect in New York the nearest thing to “Beatle-Mania.” All the American-Scottish Foundation can say is that it was wonderful to see so many enjoying the Parade. To hear first hand-accounts of the Tartan Day Parade from members of the Outlander United group, read this fantastic article by TiBS blogger and Outlander United member, Erin Conrad. It includes a slideshow of more fabulous photos from the parade. We hope to see the members of Outlander United at next year’s parade. Mark your calendar now for Saturday, April 8th, 2017! 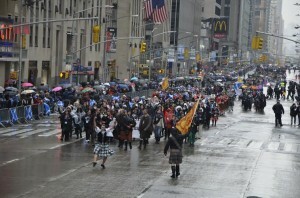 To learn more about the annual New York City Tartan Day Parade, visit the website, here. 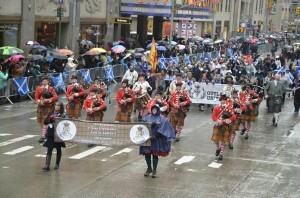 This entry was posted in ASF Events, Associate Events, Scotland-Tartan Week, Uncategorized and tagged Caitriona Balfe, Graham McTavish, National Tartan Day New York Committee, New York City Tartan Day Parade, New York Tartan Week, Outlander, Outlander United, Sam Heughan, Scotland, Scotland Now, Tartan Day, Tartan Week, Three if By Space on April 15, 2016 by Theresa Schilling.